Stick with us while we drive to countryside U-Pick apple farms in Rockford, Caledonia, Winnebago and other regions near Chicago, Illinois then head southwest across the state to Alton to check out the orchards near the Mississippi River and St. Louis, Missouri. In our family, a day trip to pick fruit, go on a hayride, or buy fresh baked goods — especially if a tight budget keeps you close to home — is the perfect staycation. Here are some tips about apple picking, pumpkin patches and fall fun in Illinois. For a complete guide to apple picking orchards and farms across the country, visit FTF’s Apple Picking USA Directory. Illinois’ rural Rockford, about an hour’s drive out of Chicago, is a city of 150,000 folks who enjoy 150 public parks, many of them filled with year-round soccer tournaments. The surrounding county is full of sprawling apple orchards and pumpkin patches, and offers seasonal fun such as hayrides and craft fairs for Christmas shopping. Edward’s Apple Orchard is an autumn staple that expanded to two locations and seems to have returned to its original one. 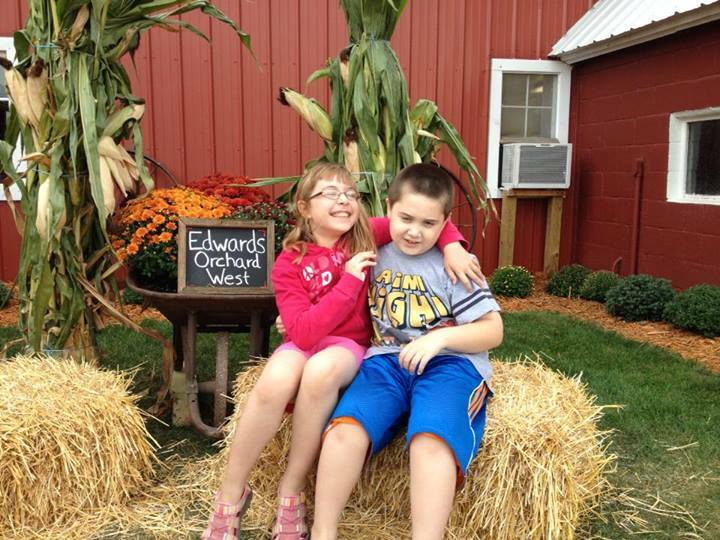 Located on more than 60 acres of family-owned farmland, Edward’s offers apples, pumpkins, raspberries, squash and other gourds, and 2,200 chrysanthemum plants. Kids will love the farm animals and horse-drawn wagon rides out into the apple orchard. Parents will love the Apple Barn, a revamped barn turned modern shop with preserves, home décor items, and of course, apples. Make sure to call ahead to book your cider donuts — they sell out fast. On Rockford’s west side is another must-visit, Curran’s Orchard, in business for more than 30 years. They specialize in using low amounts of chemicals on their apples and pure juice in their ciders. Younger children can find their way out of a mini-maze of straw bales, or peer at massive beehives through glass while parents shop for jams, apple butter, caramel apples, salad dressing, and homemade maple syrup. About an hour-and-a-half northwest of Chicago’s landmark Willis Tower is The Lindbergh Pumpkin Patch — whoever thought you could have so much fun with pumpkins! Launch pumpkins across a field with a slingshot, have your pumpkin decorated by an artist and enjoy their playground with inflatable rides. New owners, the Lindbergh Family, have turned this place into more of an amusement park with ticketed attractions than a u-pick farm. The southwest corner of the state around Alton, Illinois is another hotbed of apple picking and fall festivals, where the Fuji apples — our family’s favorite — don’t even ripen till mid October. It’s a beautiful area to explore in autumn because the Great Rivers National Scenic Byway runs through it. Families from all over Illinois and nearby St. Louis, Missouri (across the Mississippi River) love to go apple picking at Eckert’s Orchard in Grafton, which dates to 1837 and is run by sixth and seventh generation family members. Like its four sister farms in Illinois and Kentucky, you’ll find hay rides, pumpkin patches, and vendors with everything from hot dogs to funnel cakes. Weekends bring lots of extra activities and, at Eckert’s in Belleville — there’s U Pick fruits and vegetables May to December — you can even join in parent/child cooking classes. If you want a challenge, check out the 12-acre corn maze at the Eckert’s in Millstadt, where there’s also a petting zoo, bounce house and even pig races on fall weekends. In late September, the town of Godfrey celebrates the Great Godfrey Corn Maze with a day-long corn festival on the last Saturday of the month, plus wagon rides, concerts and lots of food. Come October, it reopens Friday and Saturday evenings to allow spirits to frolic in Haunted Maze, or what’s better suited to older kids 10+ looking for some supernatural fun. Plan Ahead to Pick Your Favorite Apples… and which are they? The late summer and early fall is prime apple picking time, but before you head out, consider what you’ll do with the apples that you pick. Different varieties are better suited for different purposes, so it’s best to call ahead and see what’s ripe on the trees at local orchards. The most popular varieties for eating include Macintosh, Empire, Idared, Red Delicious, Honeycrisp and Jonathon. If sauces or pies are in the plan, try the Cortland, Golden Delicious, Russet, and Mutsu varieties. Call ahead to find out what’s ripe around metropolitan Chicago, and keep in mind that the riverfront climate in southwest Illinois produces different crops.